Pokémon Tretta Lab for Nintendo 3DS is a utility to aid in the cataloguing of Pokémon from the arcade game, Pokémon Tretta. 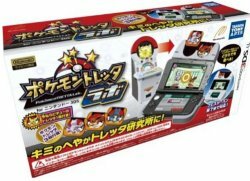 This small utility comes with a base unit to allow for the 3DS to stand, both for Nintendo 3DS and Nintendo 3DS XL, as well as a scanner attached to the top of the 3DS. Using this scanner, you can put up to two Tretta pucks in for scanning. The game is a digital title, downloaded through a QR code that comes with the scanner and tray, as well as coming with several pucks. The game has three modes. First is the Tretta Analyzer. This mode shows you the Pokémon from the Tretta puck scanned in, its type and stats. Second is the Type Checker. This allows you to compare two Pokémon and see if the type combination matches up. Third mode is Auto Battle where you scan in two Tretta pucks and it will automatically show them battle. The game comes with three unique Tretta Pucks, Rookie promos featuring Mewtwo, Lucario and Eevee. In addition to that, the first print run contains another special puck featuring Pichu. Support for this software dropped after Pokémon Tretta moved to the X & Y series in March 2014.